The fascination with Everest, and the world’s highest mountain will entice you, The Trek below Everest is truly spectacular. This trek is designed for people who want to enjoy shorter distances in the Everest region but still get face to face with Everest. We boast 100% success rate to date on this trek, achieved by adding in three extra days in the critical acclimatization period. CLICK HERE and watch some footage from the Everest region. We will lead you high into the Himalaya’s without pushing you to extreme altitude. Making the journey through the Everest Region is not only a visually stunning region, you will discover amazing cultural diversity, monasteries, adventure and not to mention the most genuine people you will ever encounter, the Sherpa people. We will enter the Everest region by air, leaving from Kathmandu on a forty-five minute flight into the village of Lukla, which sits at 2,853m/ 9,360ft. The Sherpa people dwell in this region, living along the trails, welcoming you to their villages as you move up the valley towards Mt. Everest. After recent earthquakes the local people are keen for us t return. Recent statistics show that an extra day in Namche Bazaar gives you the best chance at staying safer going into the low oxygen environment in this region. Read some REVIEWS from our trips. 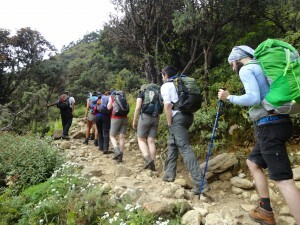 Our Tengbouche monastery trek is by no means an easy task. With our expertise and experience, we will provide you with all the necessary information you need to make your trip a success. We will make sure that you are prepared both physically and mentally as well as to make sure that you have trained with and bring the necessary gear and equipment that will make your trip on the Tengbouche monastery trek is a pleasurable and successful adventure. 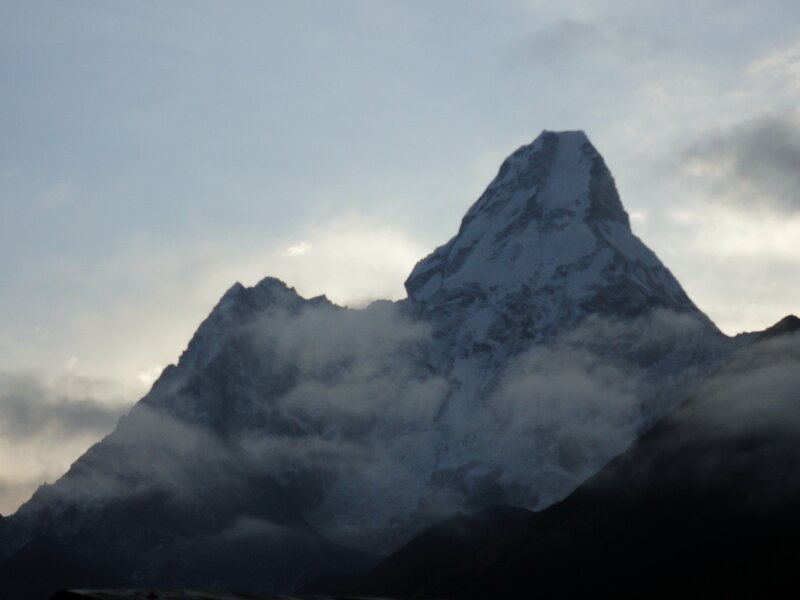 On the second day of your journey you enter Sagarmatha National Park, which holds one of the most scenic vista’s in the world, with magnificent views of Mt. Everest, Lhotse, Ama Dablam, and Thamserku, to name a few. Check out our TOP 10 TIPS for this trip. You will also venture through Sherpa villages like Monjo village and Namche Bazaar, sampling the wonderful hospitality these genuine people have to offer. Price start from $2,300. Fly to Kathmandu, Some people may choose to fly in a day early to have an extra day in Kathmandu enjoying this fast paced city and help after the earthquake. You should aim to arrive on the afternoon, the day before the trek. There are plenty of sights to visit and explore and you can pick up any last minute items on the streets of the Thamel district. Two nights accommodation in Kathmandu is included in the cost of the trip. One night before and one night afterwards on a shared basis. Fly from Kathmandu to Lukla. We will make an early morning start for the Twin Otter flight to Lukla (2,853m/ 9,360ft), the gateway to the Khumbu Region. This is an exciting flight, which should give a glimpse of Everest in the distance. 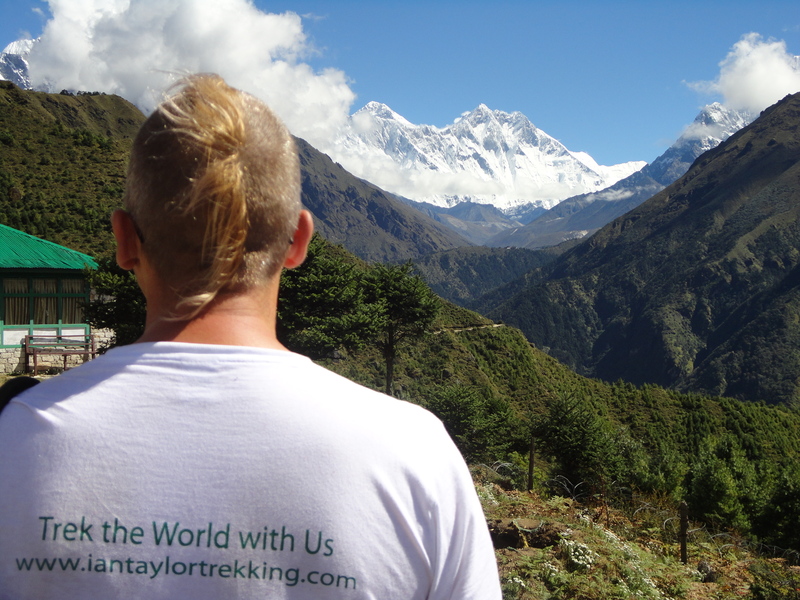 In Lukla, we will meet our trek staff, porters or yak herders and set off straightaway for our first night’s stop at Phakding (2,600m/8,500ft). Or continue on to Monjo. 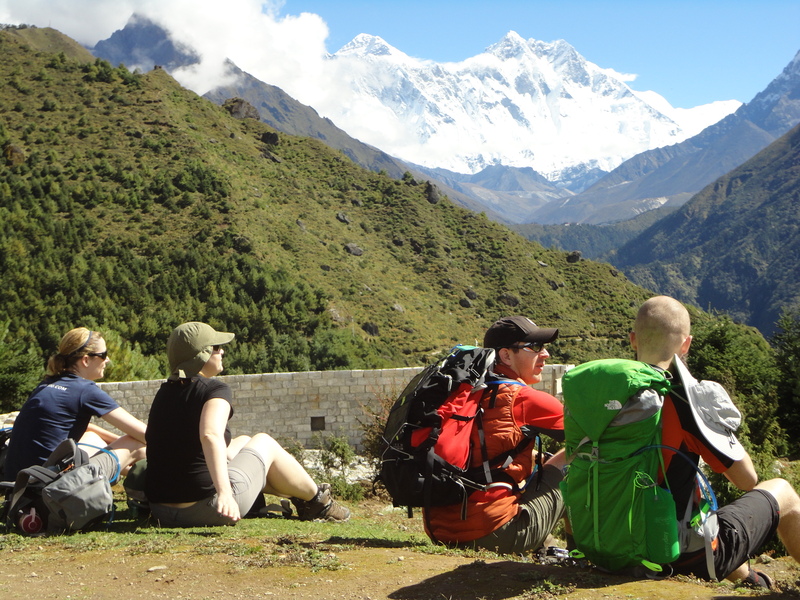 Situated on the banks of the Dudh Kosi, which drains the whole of the Khumbu Region, this small hamlet is on the main trade route through the area and there are a number of clean, well-built lodges where we can spend the night. Trek to Namche Bazaar. We will continue up the banks of the Dudh Kosi, crossing it twice by small suspension bridges before reaching the village of Monjo where we will enter the Sagarmatha National Park. 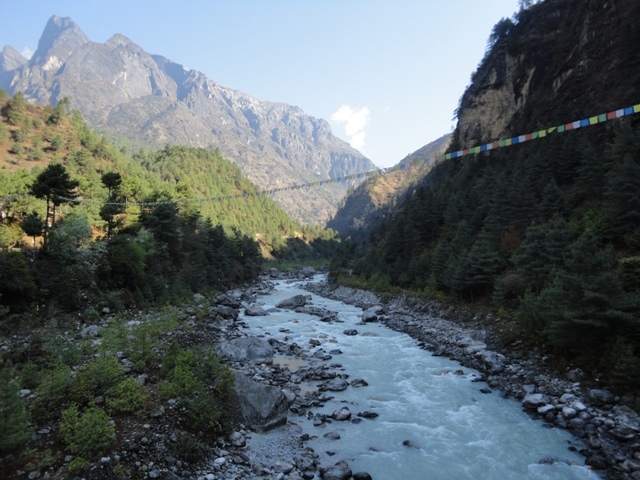 We will then cross the confluence of the Dudh Kosi and the Bhote Kosi on a high suspension bridge and climb steeply for about two hours up ‘Namche Hill’ to reach Namche Bazaar (3,440m/11,286ft). 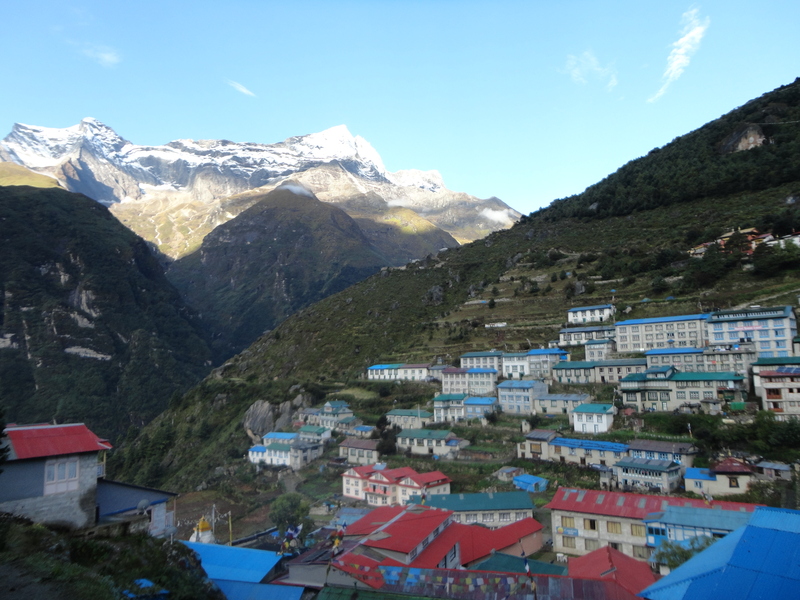 This is a prosperous trading town and the capital of the Khumbu Region. Many Tibetans cross the nearby border to trade their wares here, and the local market is a fascinating spectacle. 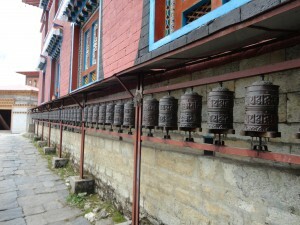 This is a good place to buy genuine Tibetan artifacts. Just across the valley to the east stand the peaks of Thamserku and Kangtega, both very impressive mountains. Today will be used as an acclimatization day as we need to adjust to the low oxygen levels. 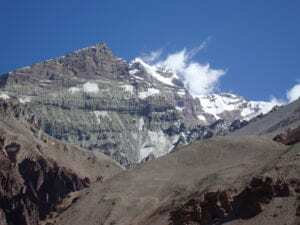 We will take a hike up the Sherpa Museum 3,600m/ 11,811 feet and learn more about the Everest region, Sherpa culture and the region that is Sagarmatha (Everest) National park. We will relax today with just one hour of hiking today. You can rest up, watch Everest movies in Cafe Danfe, eat of of cake in the Namche bakery or sit and enough the views our the window. We will spent as another day in and around Namche. 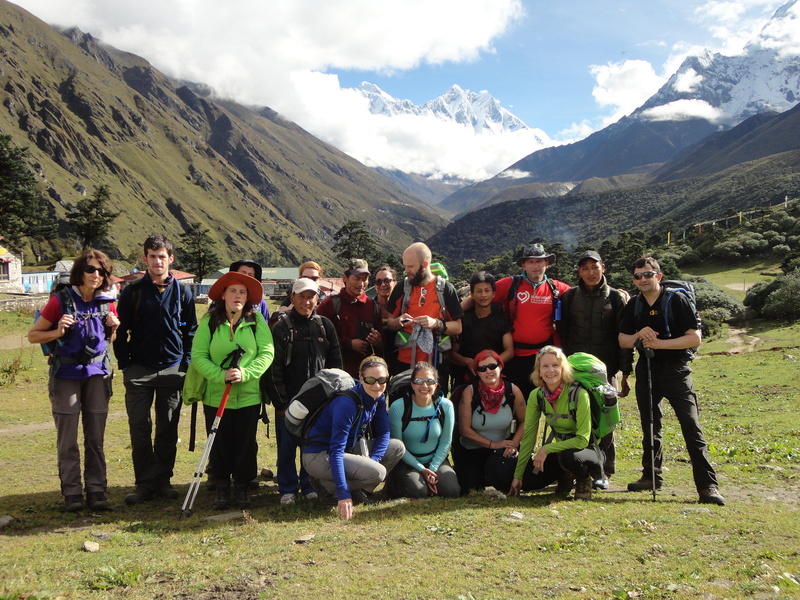 We will hike up to Shangbouche hill (3,900m/ 12,800ft) with stunning panoramic views of the whole Everest Region. During this critical acclimatisation phase, we will spend time resting and trekking to higher altitudes to aid in the process. This will allow our bodies to become acclimatized to the altitude of (3,440m/ 11,286ft). 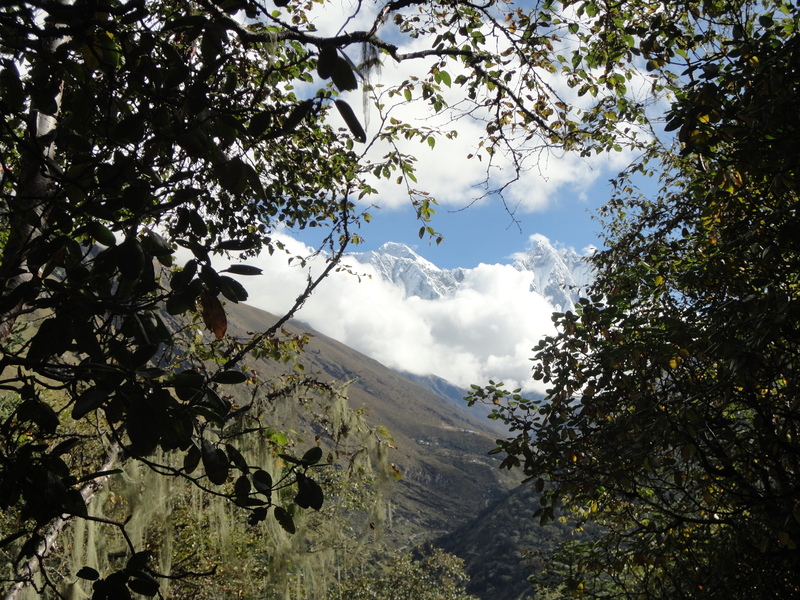 After this breath taking hike we will returning to Namche for lunch. The afternoon can be spent sampling the delights of the Namche bakery! or playing pool in Cafe Danfe. This will be vital in giving you the best acclimatization for moving further up into the Everest region and help you safely reach Tengbouche. We will spend the afternoon resting and relaxing and enjoy a nice chicken sizzler at the Himalayan lodge. You must keep well hydrated drinking 4 to 5 liters of water per day. Trek to Tengbouche at (3,900m/12,800ft). From Namche the Everest trail contours around the side of the valley high above the Dudh Kosi. As we follow the path, we will get our first really good views of the great peaks of the Khumbu: Everest, Lhotse, Nuptse and Ama Dablam. We descend down to our lunch stop passing by several small villages and numerous tea shops, we will cross the Dudh Kosi River. After our break we will make the long climb on a dusty zig zag trail. This hike up to Tengbouche should take about two hours. Tengbouche is home of an impressive and rebuilt monastery. We have plenty of time to look around Tengbouche (and have a cake at the bakery!). We will stay at a new lodge across from the monastery. Today we get up for sunrise and some work class pictures of Everest and surrounding mountains. 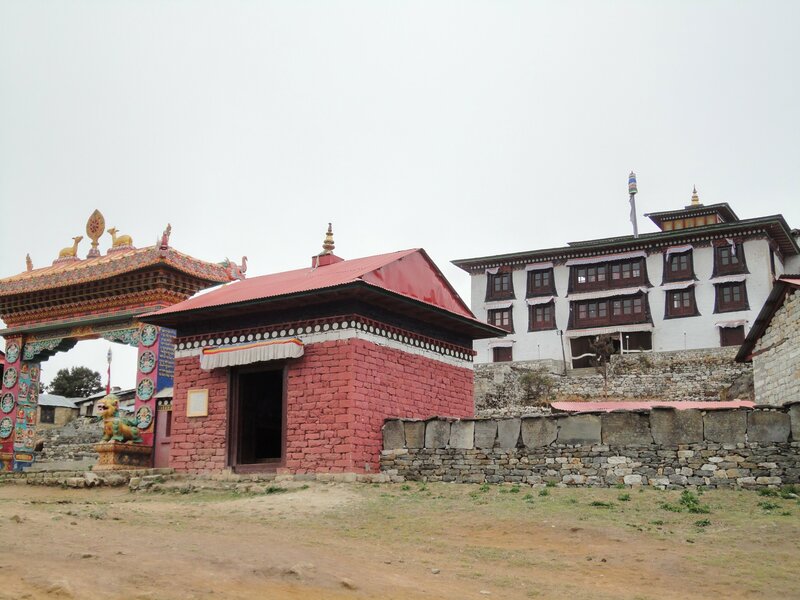 We will explore the Tengbouche monastery, take lots of pictures and enjoy the morning in Tengbouche before descending back to river for lunch and move a little higher to sleep for the night. 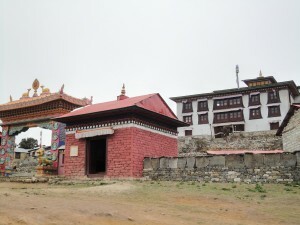 Possibly Khumjung the first Sherpa settlement in Nepal. Today we make our way back to Namche Bazaar for a shower, chicken sizzler or veg lasagna. This will take two hours to make the journey back to Namche Bazaar. Trek back down the Namche hill, where we will get our last view of Mt. Everest. We will cross over the high suspension bridge back to Phakding at 2,600m/ 8,530m and we will spend the night here before returning to Lukla where we started the journey to see Mt. Everest. Today we will make the up hill journey back to Lukla. We will take our time making our way back up to (2,853m/ 9,360ft) we will retract our steps through these amazing villages passing cheplung and looking at the work the Sherpa foundation have been doing in the region since the earthquake. We also work with the Goli village Trust which we helped establish in 2015. 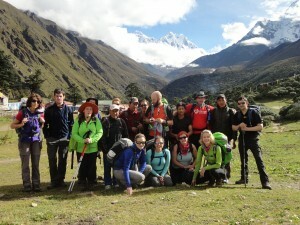 We will continue on to Lukla, have a relaxing evening and prepare for an early morning rise. Fly back to Kathmandu early in the morning and spend the rest of the day at Leisure in Kathmandu or fly back to your home destination. For those eager to see as much of Kathmandu as possible, an early start is worthwhile to visit the temples of Pashupatinath and Swayambhunath and districts of Bhaktapur and Patan as the rebuilding happens. Durbar Square is also on the essential list, as is the shopping area of Thamel. You can spend the day at Leisure in Kathmandu before you transfer to the international airport for your flight home. For those eager to see as much of Kathmandu as possible, an early start is worthwhile to visit the temples of Pashupatinath and Swayambhunath and districts of Bhaktapur and Patan. You can also wonder the streets of Kathmandu picking up gifts or take a nice relaxing message and body scrub at the Kathmandu spa. Does this information on the Tengbouche Monastery trek excite you? Take the next step towards achieving your goals of reaching Tengbouche. If so, get in touch today. We pride ourselves on making sure that our clients have every opportunity to succeed in the mountains, including professional training advice, gear lists and video links on how to pack your bag, and much more. We are always available to answer any questions you may have by email, phone or skype, so contact us today!